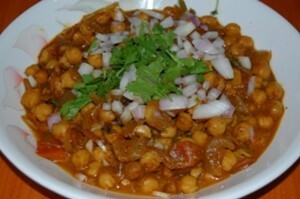 Chikkar Cholay recipe by Hina Shafiq at DesiRecipes.com. Soak cholay in water for about 3-4 hours along with baking soda. After that thoroughly wash them with baking soda and then with water. Put chana in pressure cooker with lots of water, zeera and salt . Give pressure for atleast 15 min or until they are tender and a little bit of water is left. Heat oil in a pan, add onions and fry them. When they are golden brown add tomatoes, bit salt and chaat masala in it. Cook this until oil leaves the masala, after that add chana in the masala along with the water that is left and cover it with lid. Let it cook for about 15-20 min or until the gravy is thickened and chana is so tender that they start to break. When it is ready sprinkle coriander and green chilies on it. Serve with naan and enjoy. If you want to make home made chaat masala just take 2tsp. Zeera ,2 tsp. Sabit laal mirch,2 tsp. Sabit dhania. At first just heat them on tava and then grind them. I thought Chaat masala was also supposed to have something tart like aamchur powder or aradhana powder . Yh jo 5 stars diy hain.yh chaat masala k ly diy hain.aur jo chkr chly hain.yh to simple hain.kuch unique mthd btaen plz.